Messmer’s Wood and Deck Cleaner (Part A) will clean up to 500 square feet of wood surface per 16 oz jar. One container makes up to five gallons of cleaning solution. Tough jobs may require multiple cleanings and/or a stronger mix, so coverage may be lower. 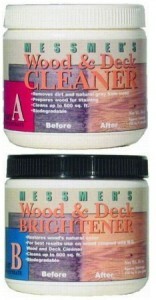 Messmer’s Wood and Deck Brightener (Part B) will brighten up to 500 square feet of wood surface per 16 oz jar. One container makes up to five gallons of brightening solution. Stronger mix ratios can be used on tougher jobs but will result in lower coverage rates. Why should I use a cleaner on my wood? Cleaning and brightening your wood before applying a quality wood finish allows that wood finish to bring out the true beauty of the wood’s surface. Properly preparing the wood before staining is a very important step. What’s the difference between a cleaner and a brightener? A cleaner is a detergent, it removes dirt and dust from the wood’s surface. A brightener removes tannin stains from woods prone to extractive bleeding, such as cedar and redwood. Tannins occur naturally in some woods and often appear as a dark discoloration after the wood is exposed to moisture. Can’t I just use bleach? Bleach is not recommended for cleaning wood. It destroys the lignin which connects the wood fibers together and gives the wood an unnatural washed-out look. Bleach should only be used to remove mildew before applying a wood finish. I have a dark discoloration on the wood, is it mildew? Place a drop of bleach (sodium hypochlorite solution) on the wood. If it lightens, it is probably mildew. Remove it with a solution of one part household bleach to two parts water, then rinse with water. If it doesn’t lighten, it’s probably just dirt, or wood extractives. Use Messmer’s Part A or WD Liquid to clean the wood. I stained my deck last year, it already looks bad! Why? Decks are hard to keep looking new. If your car sat outside for a year without being washed, would it look new? Wood traps dirt, dust, pollen and airborne pollutants, so you must remove them with a quality deck cleaner. We recommend cleaning your deck at least yearly. Twice a year is better. Don’t reapply stain too frequently, this can cause blotchiness and shiny spots. Mix concentrates with water as per the label instructions, then apply with a garden sprayer or mop. After about five minutes, use a push broom or brush to scrub the wood surface. After allowing the product to work for twenty minutes, rinse with clean water. Yes, when label instructions are followed properly. They will not harm the wood, your plants or your lawn and are bio-degradable.